I love a navy + white combo. It's so clean and refreshing. I went to the mall two days ago and snatched up a few new favorites. One, how gorgeous is this lace blouse! I'm obsessed with every detail about it, especially the scallop details on the sleeves and around the hem. Secondly, this polka dot bag by Brahmin stole my heart. Macy's was having their F&F sale, making it 25% off, so I just had to buy it. 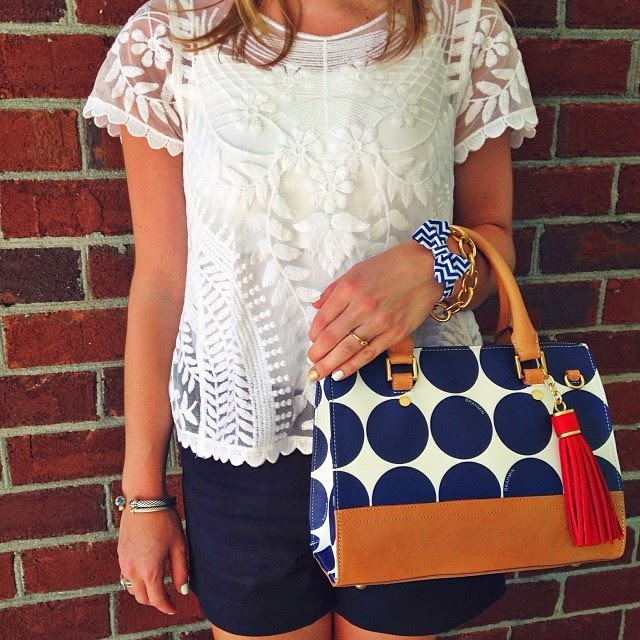 It's a great bag full of fun details with the polka dots, the tassel, the brown leather…I'm in love. This print is available in several different styles, also (see here). A Brahmin bag would make the perfect Mother's Day gift as well. Isn't this print so cheery? This is adorable! I love the lacy white shirt. Navy and white is my favorite color combination too! LOVE the outfit! I'm loving this look! That bag is so cute! Aw Rachel, I love this photo! That top is too cute, perfect for spring and summer! That tassel on the bag really completes the look!